ISO 450012018 is the replacement to OHSAS 18001 and is the international ISO standard for Occupational Health and Safety Management Systems (OHSMS). ISO450012018,Occupational health and safety management systems- Requirements with guidance for use, provides a robust and effective set of processes for improving work safety in global supply chains. Designed to help organizations of all sizes and industries, the new International Standard is expected to reduce workplace injuries and illnesses around the world. The purpose of an OH&S management system is to provide a framework for managing OH&S risks and opportunities. The aim and intended outcomes of the OH&S management system are to prevent work related injury and ill health to workers and to provide safe and healthy workplaces. Risk.A universal definition of the term 'Risk' is clarified in ISO 45001 as the meaning of this varies in some countries. The term 'Hazard Identification' is covered by the terms 'risk identification and 'risk control' to ensure we encompass all potential hazards applicable to all industries and sectors. The worker.There are differences in the definition of this term and various legal constraints around this term in different countries - in the context of ISO 45001, 'The Worker' is defined as the person working under the control of the organization and includes subcontractors. 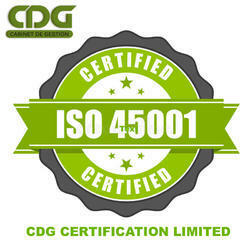 CDG is a leading ISO 45001 certification company of India. We provide ISO 45001 certificate to every kind of business.